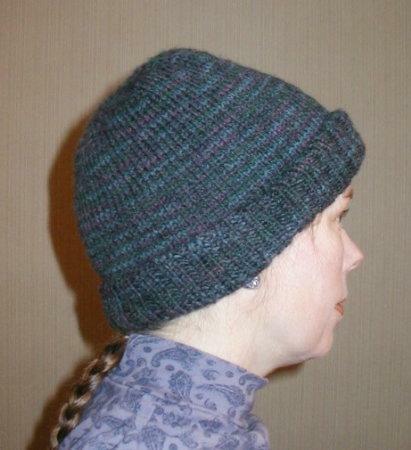 Yes, I knit another hat. (And no, I haven’t given up quilting; I’d hoped to be done with my latest baby quilt by now but my sewing machine and I are going through a rough patch in our relationship and it’s been slow going.) None of my previous hats are really warm enough for a serious winter day, and after a mild January, we’ve had some serious winter days here lately, so I thought I’d give this pattern for a double layer hat a try–two layers has got to be warmer than one. We came home and I kept knitting, and then I ran out of yarn. Well, yes, I guess the pattern does say 200 grams, and the ball (or is it a skein?) of Encore is less than 200 grams, so that really shouldn’t have come as a surprise, but I was still a bit put out. I was so close to finishing and I really wanted to see how it was going to turn out, so I used some blue left over from my other projects to fill it out. Hey, it’s double layer, so I could just put the blue inside and no one would know. I wove the last end in and tried it on and while it was nice and warm, it was a little short overall and the cuff was a little skimpy. Bummer. I stopped at the yarn shop again, only to find no more balls of the same dye lot I’d used. I could have gotten another dye lot–with variegated, would it matter that much? I don’t know. Instead, I got a solid mauve (Encore Worsted 9621) and a heathery blue (Encore Worsted 1793) that coordinated and decided I’d make one half stripes, and as you see, that’s just what I did. As long as I was ripping back, I decided to make it longer at the same time, so I ended up taking out more than half of what I’d already done. It probably would have been faster to get two balls of the other dye lot and made a whole new hat. 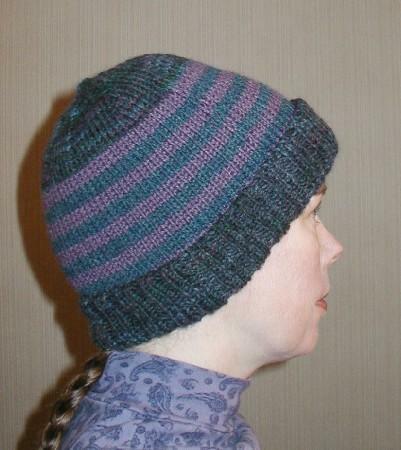 I think a few more rows would make this hat better still, so that’s what I’m planning for the next time I make it. I was hoping the yarn for my sweater would be here by now, but it’s not, so it’s looking like another hat is on its way soon. Next time I want yarn for a sweater and can’t find it locally, I’ll order online, as I’m sure the places that have it in stock would have gotten it to me in less than the month I’ve waited for my shop special order so far. I do like to support local shops, but I really was hoping to make a sweater while it’s still cold enough to wear it. Of course, once I do start on it, I may find it takes a really long time and there never was any hope of getting it done this winter anyway. Time will tell.